We have been continuing our maths topic of shape – including 2D shape recognition and finding out those that are symmetrical or not. (We hope that looking for pentagons as homework was not too stressful for you … it was surprisingly tricky! However some of you were quite canny – a shed and a football featured!) We have also been sorting out shapes by their properties to make Venn diagrams. It was Mrs Blacker’s class turn to make vegetable soup this week …all good practice using knives and peelers! The general feeling was: they didn’t like it, they loved it! It was delicious! However it was noted that a few just wanted to stir their soup! 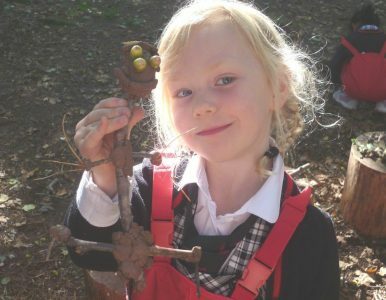 In the woods, Mrs Lock’s class made a variety of creatures including a dragon, pig and lots of people using natural materials. We had great fun fixing body parts onto our creations with clay and wool!